7/20 Cup of Coffee: Another home run from Rafael Devers was not enough for the PawSox, while Trey Ball was hit hard again in Portland. 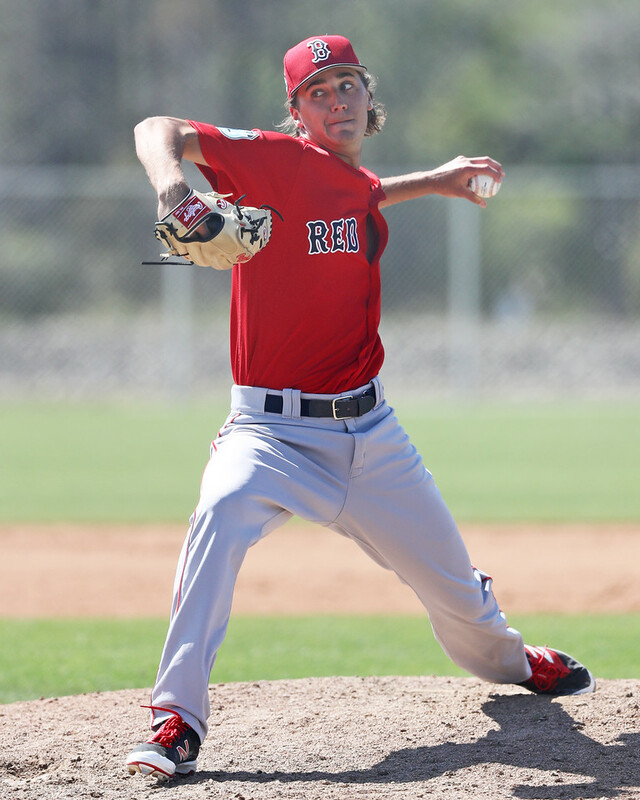 Greenville's offense came out firing in support of Kyle Hart (pictured), Lowell's recent slide continued, and Alexander Martinez drove in another run for the DSL Red Sox. It was a strange day in Pawtucket, as the PawSox used a position player to pitch in a one-run game in the eighth. Kyle Kendrick helped out the short-handed pitching staff by going the first six innings, allowing three runs on seven hits. Austin Maddox pitched the seventh, allowing one run with three walks. He needed 35 pitches to get through the inning, and with no other pitchers available due to injury or rest, infielder Mike Miller came on for his third appearance of the season. He allowed three runs on five hits over two innings as the Mud Hens pulled away. Rafael Devers seems unfazed by his promotion to Pawtucket, as he is now 8 for 19 with two home runs after going 1 for 4 with a two-run opposite field home run on Wednesday. Tzu-Wei Lin went 1 for 4 with a triple in his second game back with the PawSox, and Sam Travis went 2 for 4 with an RBI in his first game back with the PawSox. A combination of rough pitching performances and defensive miscues sunk the Sea Dogs. Trey Ball allowed four unearned runs over his three innings, but he also gave up five hits and two walks, with one of the hits being a three-run home run. After turning in his best start of the season on July 7, Ball has given up 14 hits over his last four innings. Taylor Grover struck out seven over his four innings but also allowed three runs on two hits and two walks. The bottom of the order did the most damage for the Sea Dogs, with Cole Sturgeon, Jordan Procyshen, and Nick Lovullo combining to go 7 for 12 while the rest of the offense went 4 for 24. Five players had multi-hit games as the Drive clobbered the Grasshoppers. The top four batters all had two hits, with Lorenzo Cedrola and Roldani Baldwin each notching a single and a double, while Tyler Hill had two singles and stole his 28th base of the year. Isaias Lucena only had one hit but he made it count, launching a two-run home run, his second of the season. Kyle Hart got the win as he went five shutout innings, walking two and striking out three. He also did a good job of keeping the ball on the ground, recording eight groundouts with only one flyout. Pat Goetze went the final two innings, allowing one hit while striking out three. The Spinners have now dropped seven of their last eight games after falling to the IronBirds. Yorvin Pantoja allowed two runs over the first three innings, walking three without recording a strikeout. Devon Fisher held Aberdeen hitless over the next three innings, and Joan Martinez added another scoreless inning as his ERA dropped to 1.35. Most of the offense was provided by Nicholos Hamilton, who went 2 for 3 with a double and a triple. Brett Netzer went 1 for 3 with an RBI, and he has at least one hit in eight of his last 10 games. Wednesday's game was suspended in the bottom of the third inning due to rain. Shortstop Andre Colon already collected two hits in his two at-bats, and Juan Perez threw three hitless innings. The Marlins left the tying run on second in the bottom of the ninth as their rally fell just short. Gregory Santos was wild but effective, walking four but allowing only one run on two hits over five innings. Santos has allowed only three earned runs over 30 innings this season. The Red Sox managed only five hits, but they benefited from the Marlins committing six errors. Alexander Martinez singled and drove in a run, and Reinaldo Ugueto singled, stole a base, and scored two runs. Player of the Night: With no real standout performances, Kyle Hart's five shutout innings with an impressive groundball rate was enough to take home the honors. That is now three straight scoreless appearances for Hart, who has not allowed a run over his last 16 innings. Hart has allowed only two runs over 22 1/3 innings in July, while surrendering only 11 hits and five walks with 17 strikeouts. The 24-year-old has a 1.90 ERA since joining the Drive in May, and the left-hander appears ready to handle the Carolina League.